Published by the American College of Sports Medicine, this authoritative manual teaches health fitness professionals and students how to appropriately conduct fitness assessment testing. The focus on assessment makes this content critical for those studying to enter the fitness and rehabilitation fields, as well as those already working who need to align their practice to industry standards. This new edition has been fully updated to reflect key changes from the tenth edition of the ACSM’s Guidelines for Exercise Testing and Prescription. 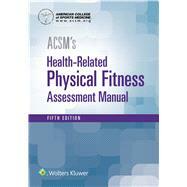 The goal of this Fifth Edition of ACSM’s Health-Related Physical Fitness Manual is to provide a comprehensive overview of why and how to perform assessments of the five health-related components of physical fitness, namely body composition, muscular strength, muscular endurance, flexibility, and cardiorespiratory fitness.